I’ve been without a decent desk chair for a few years. When I first moved to Baltimore, I took a cheap, uncomfortable, wooden chair with me because that’s all I had room for in the truck. I was going to be hired and paid a handsome salary in less than a month and would have plenty of money to buy a better one. Ah, the naivety. Two years later, with a good job and my own home office, I’ve finally plunked down the cash on a good desk chair. I was looking for something along the lines of the Aeron chair: mesh seat and back, adjustable, and stylish—without the Herman Miller price tag. 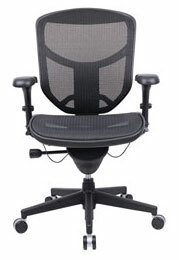 What I found was the “Office Depot Brand Quantum Mesh Mid-Back Task Chair” (which sounds almost as catchy as “Aeron Chair”). What it lacks in name-dropping and the high-end touches of the HM version, it makes up for in price. At about $300, it’s about 75% cheaper than the original Aeron. Even at that price, everyone I’ve talked to thinks I’m crazy for spending that much on a desk chair; what makes sense for me is that it’s the most comfortable computer chair I can afford. Considering the amount of time I spend at my desk, a little comfort goes a long way. Every year I tell myself that I’m doing all my shopping online since most stores are packed around the holidays. Each year I tell myself that I’ll do all my shopping a few months before the crowds hit the malls. Sometimes I swear off buying gifts all together. I’ve never planned to wait until a week before Christmas to start shopping, but I do just that consistently. Wake me when it’s over. My Kodak CX4230 has worked reasonably well in the nearly four years I’ve owned it, but my eyes wandered to smaller, more powerful models more times than I care to admit. There were significant limitations to my camera, but the picture quality was decent despite its 2.0 megapixels and slow processor. Learning the half-press shutter trick was instrumental in extending that camera’s life. The camera must be small enough to fit in my pants pocket. It must be 5 megapixels or more. Have both a large LCD screen and an optical viewfinder. At least 3x optical zoom. It’s a short list of standards that leaves a lot of players on the field, but I was able to weed it down to one camera: the Cannon PowerShot SD700 IS Digital Elph! The SD700 exceeds these features with 6MP and a 4x stabilized optical zoom. It also boasts one of the best camera processors on the market (the DIGIC II engine featured in their digital SLR cameras), 16×9 widescreen mode, and a video mode with sound. I’m hoping to order it within the next two weeks or so—possibly in time for my birthday—and I’d like to write a little review here, comparing my expectations with the results. Stay tuned. Update: After reading my friend Joe’s post about camera shopping, I noticed on DP Review that Cannon now has a PowerShot SD800 IS. It’s about $60 more than the SD700, but has 7.1 megapixels, wide-angle zoom, a new, DIGIC III processor, and face-detection to increase the image quality of people pictures. Looks like my final answer just upgraded. Update Two: Turns out, the SD800 IS isn’t available until November; delayed gratification for me. Update Three: I received my new Cannon SD800 IS in the mail today! Despite the previous update, Amazon has been selling this camera for at least a week (Oct. 27). Well, I’m back in Scranton after the whirlwind of holiday festivities that was my Christmas break. I meant to post several times to cover each little event, but time is rarely on my side. However, Annie and I managed—somehow, I’m still amazed by it—to do all of our Christmas shopping within 36 hours, much of those hours on Christmas Eve. Once we got past the stress of the shopping insanity, Christmas was relatively relaxing. For Christmas, I received quite a few things that I had on my wishlist, but also a few things that I did not expect. I think that formula works well; I wasn’t disappointed that I didn’t get what I asked for, however, there was still some mystery when I opened my gifts. I received a new AFI’s Black Sails in the Sunset, Rammstein’s Reise Reise, Jim Gaffigan’s The Last Supper, O’Reilly’s MySQL Cookbook, Eric Schlosser’s Fast Food Nation, and the 24 Season One DVD set which will have me set in the consumable media department. I also received a great Norelco electric shaver, a zip-up sweatshirt, a sweater, the 2004 Hess Truck (a tradition for me), a 256MB portable USB drive, a page-a-day calendar with recipies, as well as some wonderful monetary gifts. Over the next couple of days, Annie and I went to see Lemony Snicket’s A Series of Unfortunate Events and The Aviator. Each one is very different from the other; both are highly recommended. This New Year’s, Annie and I broke our tradition of coming to Scranton’s First Night celebration— as we have done for the past four years—and decided to head to Baltimore to ring in the New Year. The weather was unseasonably warm, especially when compared to how bitterly cold Scranton can be in December/January. However, I was a little disappointed that the fireworks at Inner Harbor were not any more impressive than Scranton’s. On New Year’s Day, the weather in Baltimore did not match the date: it was a bright and sunny 68 degrees. Which is wrong; very, very wrong… but nice! And now, I’m back in Scranton, as I mentioned earlier. It seems strange to be back at college so soon after the holidays; usually, I stay home during Intersession, but I’m directing a play for the Playwright’s Festival and working at the CTLE this January. Hopefully, I’ll finally have the time I need to finish a few projects that I’ve been pushing to the side. I thought summer was supposed to be nice and relaxing; three months of boredom and eager anticipation for the first day of school mixed in with some healthy dread. However, nothing I think is close to reality. This summer seems to be flying by; not just going fast, but literally launching itself into some breakneck orbit. I realized this week that there’s less than a month until I move back to Scranton. There was so much that I wanted to accomplish before September and only a fraction has been finished, let alone started. I wanted to thoroughly clean my room and car, both are started, but neither are finished. I wanted to really get some web sites up and running; two are up, but one has already been shut down because the clients decided not to continue their business. And then there was that whole “I’m going to write a novella or an all-out book while I’m on my leave of absence.” You’re reading the only thing that I’ve written. It hasn’t been a wasted summer, but I really could use a few more months. On a fun note, I bought a flat-panel monitor and a nice scanner when I was at Sam’s Club on Thursday for much less than I imagined. The monitor, a 15-inch Samsung, was the display monitor and sold for $90. The scanner, a 48bit high-end HP with 35mm slide attachment and automatic photo-feeder was only $40 because it was also a display model. I could not believe the prices on the items, and the only difference between my bargains and full-price is that neither item came with the box. I think I can make due without a little cardboard.